Eye diseases in cats are quite common. When detected early and properly prescribed by a veterinarian treatment, these diseases can be cured. The vet, depending on the diagnosis prescribes necessary medicines. 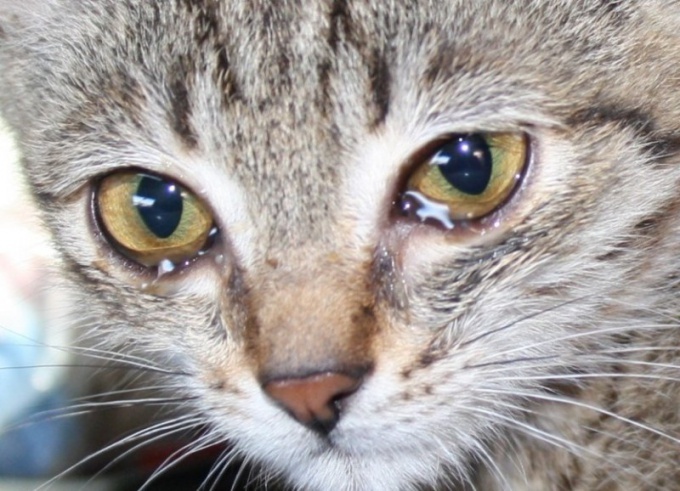 Most often in cats from eye diseases occur conjunctivitis, epiphora (watery eyes), foreign body in eye, and eye damage. Conjunctivitis in cats is an inflammation of the cornea. It can be an independent disease or accompany infectious. Tearing is the first sign of conjunctivitis. In milder cases it can pass on its own in 3-7 days. In more serious the tear, the discharge becomes yellowish, abundant, have a sticky consistency, accumulate in the corners of his eyes. In this case, the treatment should be a compulsory. Before you cure the cat from inflammation of the cornea, should first eliminate the reason for which it arose. If within 3 days the conjunctivitis has not passed, you must contact your vet. He will prescribe eye drops, antibiotics, and explain how to perform the wash procedure eyes. Epiphora in cats is a tearing, which goes beyond the normal. Its causes can be different: conjunctivitis, allergies, blocked tear ducts, damage to the cornea, and inflammation of the connective membrane of the eye. In addition, it may be a symptom that accompanies some infectious diseases - for example, the upper respiratory tract. In some cases, the result of watery eyes in cats changes the coloration of the coat under the eyes. In these places the wool should be thoroughly washed or even shave. Inflammation of the cornea and profuse watery eyes can be signs that the eye is damaged or it has got a foreign body. To determine the causes of these symptoms eye examination cats need to hold in bright light. To remove a foreign body, put your thumb of one hand on the edge of the upper eyelid and the thumb the other on the edge of the lower eyelid. Pull the eyelids and inspect the eyeball. Compare the eye, which is the damage healthy. The top surface of the cornea healthy eyes smooth and clear. If you will notice in it a grain of sand or speck of dust, gently remove it with a wet gauze pad. To do this, swipe them towards the corner of the eye along the inner surface century. If the foreign body is large, carefully remove it with your fingertips or tweezers. If this is not work, it is necessary to consult a specialist.